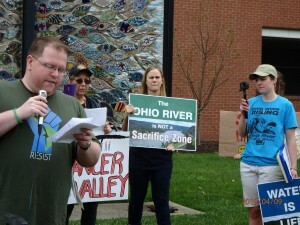 MORGANTOWN, W.Va.—Today more than 50 people representing more than a dozen grassroots groups from West Virginia, Ohio, and Pennsylvania gathered to show their opposition to the Appalachian Storage and Trading Hub, a petrochemical mega-complex build-out proposed for the Ohio and Kanawha river valleys. The group gathered outside the Marriott at Waterfront Place as the West Virginia Manufacturers Association was hosting the Marcellus and Manufacturing Development Conference, where the Hub was to be a main topic. The end products of a Hub would be plastics, and its feedstock would come from an increase in regional fracking, which is already wreaking havoc in some north-central West Virginia counties. The infrastructure related to a Hub would stretch along more than 400 miles of the Ohio and Kanawha rivers, and reach into 50 counties in West Virginia, Ohio, Pennsylvania, and Kentucky. “It is of upmost importance that people see these current and proposed petrochemical projects in Appalachia for what they are: a scheme that the oil and gas companies are using to bail themselves out of debt. Appalachia has been exploited enough. 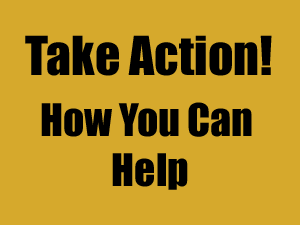 Every stage of the life-cycle of plastic is toxic and harmful to human health and the environment—from the extraction of the natural gas liquids to the manufacture and use of the products, to the disposal of them. The tide needs to shift to alternatives to plastic, rather than creating more,” said Bridgeport, Ohio, resident, Bev Reed, who attended today’s event. She lives near the site of one component of the Hub, the planned PTTG ethane cracker plant. Participants in the protest worried about the human health aspects of the Hub. They spoke about the warnings they are receiving from their allies who live in petrochemical regions of Louisiana and Texas known as “Cancer Alley,” and cited the recent petrochemical fires near Houston as reason enough to question the proposed Hub. They talked about Bayou Corne sinkhole, an ongoing incident in Assumption Parish, La., where residents who had been living near a collapsing storage cavern operated by Texas Brine Company and owned by Occidental Petroleum have been evacuated. Due to the direct human health impacts and the potential for deadly and costly disasters, participants in today’s protest questioned the wisdom of government loans and tax breaks aimed at facilitating the construction of components of the Hub. Given the likelihood of a dramatic increase in regional greenhouse gas emissions from Hub-related infrastructure, participants also questioned the sanity of the Hub. 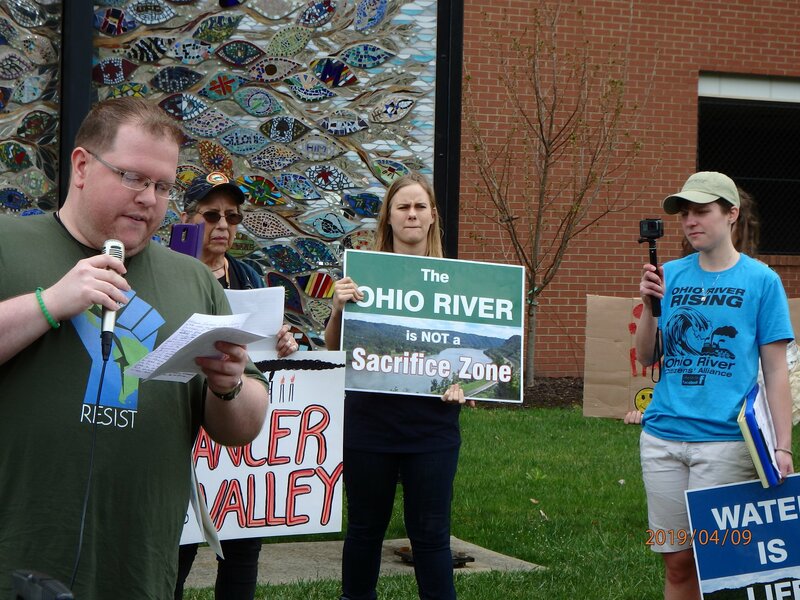 “It’s nuts for our state to bow down to another round of abuse from fossil fuel corporations,” said Dustin White, project coordinator with OVEC, the Ohio Valley Environmental Coalition, which is based in Huntington, W.Va. “We deserve a diverse and sustainable, community-led economy that is not dependent on fossil fuels with all the associated health and safety risks. Workers deserve better than more toxic jobs. “The ASH scheme is an unimaginative regression to 1950s era economic development. Why can’t we have real innovation? Development focused on tourism and cottage industries could allow our area to be part of real progress, toward a world we’d want our grandchildren to live in,” White added. Groups involved in the planning of this event include OVEC-the Ohio Valley Environmental Coalition, Concerned Ohio River Residents, Indigenous Environmental Network, Sierra Club WV, Sierra Club OH, Center for Coalfield Justice, Breathe Project, Mountain Watershed Association, and Climate Reality Project: Pittsburgh. Previous post: Key Indicators of Arctic Climate Change: Unpresentented Melting!